Release the pets from their pet boxes where possible. Try to clear large clusters of blocks to activate the hammer booster. Use the balloon immediately as it falls above the screen. Your primary task in this phase is to “drive” a half blaster to the last line. We did it in the last column and with a move we rescued many pets and released all the other from their pet boxes. After that use the half blasters, the bombs and the hammer (that gets activated) to rescue the demanded number of pets. Just one more tip: Try to have always a blaster in the last line to use it to rescue with a move more than one pets. 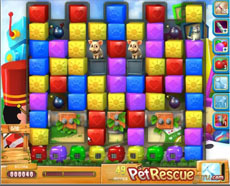 Stuck on pet rescue 540? No problem. The following video is what you need to complete it.